The next time you visit a friend’s home or workspace, look around. Chances are, you’ll find some type of indoor plant on display. Incorporating greenery—even something as low-maintenance as a succulent—into your surroundings is a growing trend. That’s because plant care can be treated as an extension of self-care, especially in a concrete jungle like Manila. 1. Being around potted plants has a lot of physiological and psychological benefits. According to an article published in Psychology Today, being surrounded by plants can lower your blood pressure, improve your reaction time, make you more attentive, and decrease your anxiety. 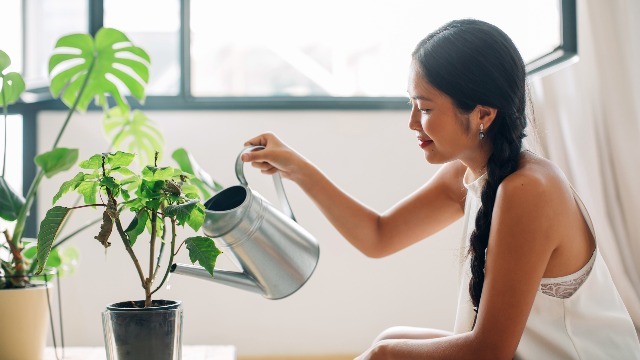 In addition, a study published in the Journal of Physiological Anthropology has found that indoor plants promote comfortable, relaxed feelings. Who knew having a little bit of nature nearby could affect you so much? 2. Plants improve indoor air quality. Plants are natural air purifiers. They can diminish toxic chemicals found in cigarettes and paint, among other things. Additionally, plants can make the air more humid, which is a plus if you have dry skin, dry throat, or sinus congestion. 3. Houseplants can help you sleep. Are you tossing and turning at night? Certain types of plants, like lavender and jasmine, can soothe you with their scents. Try placing some lavender by your bed to help you catch some Zs. 4. Plants force you to take a break. The best cities invest in parks and shared community spaces for a reason. We live in the digital age, and whether you notice it or not, it’s hard to disconnect from your screen. Being around plants can take your mind off whatever’s causing you stress, even if it’s only temporary. If you don’t have the time or patience to take care of your own plants, you can still enjoy all the benefits they can bring by residing in an area surrounded by lush greenery, like The Florence at McKinley Hill. This garden-inspired residential community lets its residents enjoy colorful gardens and open spaces in the heart of Fort Bonifacio. At The Florence, your mind and body will be rejuvenated. Learn more about The Florence at McKinley Hill here.